This is an overview post to give context (based on my own perspective) on a couple other topics I am writing up. I don't think there is anything novel about the content. There are many different opinions on the nature of this crisis: it is a crisis of confidence that will heal when people come to their senses, it is just a bad version of the types of recessions we are used to since WWII, we are headed for stagflation or hyper-inflation, it's all the government's fault, it's all the fault of greedy bankers, it's contagion from the "subprime crisis", etc. I am among those who view it as a crisis of excessive leverage (household, corporate, and financial) and believe Hyman Minsky's theories on financial instability (and a few related theories such as Fisher's debt deflation) provide the most relevant explanation. Since the early 1980s (but especially in the 2000s) unsustainable debt was accumulated by individuals and companies and ignored (and even encouraged and made worse) by regulators and central bankers, and much of the debt only made sense (i.e., would be serviceable or repayable) in the context of continually rising asset prices. This is like a Ponzi scheme. Minsky described such dynamics as intrinsic to human nature, for example our tendency to base expectations of the future on the recent past. He suggested that when risk looks low people take on more and more risk and this can reinforce booms in asset prices (e.g., housing) for a while due to positive feedback loops, so people keep taking more and more risk as their actions seem to be rewarded. But eventually reality takes over and the asset bubbles run out of momentum. This dynamic seems to have occurred repeatedly over the last several hundred years each time the last generation that experienced it leaves the picture, the institutional memories are lost, and those newly in power arrogantly believe they are so much smarter than the last generation that such past crises could never happen again! A lot of the wealth seemingly created over recent years (and decades) was illusionary and unsustainable, based on expectations of asset price growth continuing indefinitely at a significantly faster pace than underlying economic growth. But money and financial markets alone cannot create wealth, they can only facilitate the exchange of property, knowledge, and services between people. Real wealth comes from economic growth which comes from productivity improvements and expansion in demographics. So there should be no expectation that if only confidence recovers, then stocks and housing will quickly bounce back to their former valuations (or even close). This crisis shares the same underlying causes and dynamics as both the Great Depression and Japan's Lost Decade, though the current debt levels are much larger. There are two commentators in particular who I think make this case very well -- i.e., they explain their reasoning in great detail rather than simply asserting their conclusions and leaving people to wonder which of the many assertions out there to believe. Bernanke an Expert on the Great Depression?? Talk to the Fabian Forum: The Global Financial Crisis: How bad will it get? Keen's work builds on the theories of Hyman Minsky and Irving Fisher among others. The essence of the theory is that the markets, not the government, are really in control of the credit creation process. With debt now at saturated and unsustainable levels and consumers in shock and undergoing a generational shift in mindset toward frugality, the market will now lead to a lower aggregate private debt level, not higher, despite the government's desperate efforts to prevent deleveraging and expand borrowing further. Keen does not expect inflation to come roaring back despite the best efforts of governments to reflate, due to the sheer overpowering magnitude of the deleveraging process relative to the amount of money being "printed". Eventually we should have a slow return to inflation (absent large supply shocks or other events external to the money and credit dynamics of the economy) but that can take a long time — see Japan. The US private debt-to-GDP ratio was around 300% at the start of this crisis. At the start of the Great Depression, it was around 180% (it spiked to 250% when GDP crashed). In Japan in 1990, private debt-to-GDP was around 108% of GDP based on Keen's data (I am not certain of what is included in this calculation as I have seen other reports that put it around 190% of GDP at that time). The charts below are from Steve Keen but the US one is available in many forms in other places. [UPDATE 7/14/2009: It appears that the other sources I'd seen were correct and Keen's data on Japan was incomplete. 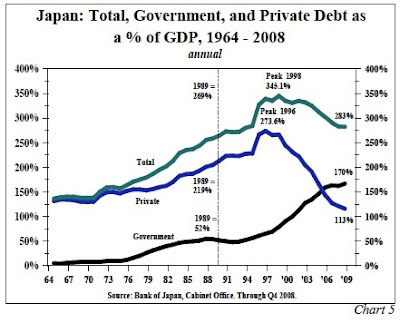 Here is a more accurate graph showing Japan's private debt-to-GDP at 219% in 1989 and around 274% in 1996. I'll leave the above one in so as not to butcher this post too much, but please disregard it. Even if the government prints more base money, that does not magically invoke the historic money multiplier and cause broad money supply and inflation to expand accordingly, because for expansion in aggregate lending to occur there have to be willing and qualified borrowers as well as willing and well-capitalized lenders. But in the experience of both the Great Depression and Japan, individuals and companies chose to pay down debt faster than taking on new debt, so broad money and credit on aggregate actually contracted, even with money seemingly being pumped into the economy. Contracting credit combined with slowing velocity of money (as economic activity slows down) both contribute to deflation. UPDATE 5/22/2009: Astute analysts such as David Rosenberg point to the "secular shift in attitudes toward credit", i.e., a permanent reduction in willingness and ability to take on debt. We’re certainly in the midst of a once-in-a-lifetime set of economic conditions. The perspective I would bring is not one of recession. Rather, the economy is resetting to lower level of business and consumer spending based largely on the reduced leverage in economy. One of his key claims is that Japan was successful in preventing a depression. (With some reservations, I'll tentatively agree at least with respect to the medium term outcome — their long term outlook and ability to repay their government debt is debatable). Japan's relative stagnation has been mocked by the US in particular since 1990, but few stop to think what the alternatives might have been to their current outcome. They lost 3 times their annual GDP in housing and stock market wealth (equivalent to a loss of $45 trillion of US wealth now, see Exhibit 12), yet their GDP never fell sharply like the US's did during the Great Depression, and GDP actually continued rising slowly. Unemployment didn't get anywhere near Great Depression levels. But note that their stock market and housing prices are still down dramatically from peak after 20 years. And Japan's sometimes exaggerated (though real) positive impacts from exports and negative impacts from demographics don't change the core underlying comparison of debt-driven asset bubbles as the root cause of crisis. Granted, Japan's stock market bubble was bigger as measured by P/E ratio, but the US has had a larger earnings bubble (unsustainable "financial innovation" boosting apparent profits to record levels in the last several years), and the real estate bubbles are huge in both cases. Unfortunately Steve Keen is not optimistic about our situation today compared to Japan's, given the significantly higher debt levels today. [UPDATE 7/14/2009: Note that his post used incomplete private debt data for Japan (see above) so the comparison is not as bad as it looks in his post (thankfully!)... though the US private debt is still higher than Japan's was, and the problem is still more global today.] And today's situation is worse in other respects than just debt magnitude. This crisis truly is different than most other crises (as well as normal business cycle recessions) due to the weak demand for new loans, the systemic breadth, and the underlying dynamic of collapsing asset bubbles, excessive debt, and fragile balance sheets. And the macroeconomic aggregates of money supply, potential growth, etc that conventional economists often use don't properly account for insolvency at the balance sheet level within the economy. Here is a graph (Exhibit 7 in Koo's March slides) showing one measure of demand for loans falling in the US today, to reinforce his point in the "types of crisis" exhibit above. Richard Koo discusses policy solutions as well as underlying causes. My focus is on highlighting his data and analysis on the experience of Japan since 1990 and the US during the Great Depression — his prescriptions and conclusions about the ultimate success of Japan are more controversial and I am somewhat unsure as to my position on those arguments. While government policy can make some difference in addressing this type of crisis, it cannot solve it, and there are limits to what even the most perfect policy could achieve. The Federal Reserve responses so far have been primarily focused on supporting liquidity (which is important if done in an appropriate way, not entirely true so far) and have so far prevented a systemic meltdown, but liquidity provisions can't solve a crisis of solvency. They can help buy time, which can help in partially repairing balance sheets via earnings. Other government responses to date (TARP, the stimulus bill, etc) target the solvency issues, but their magnitude is much smaller than the size of the crisis, and political limitations are already in play. Note I'm not advocating that a larger government response is necessarily better or more effective over the long run — there are big costs to weigh and no easy answers. Ultimately GDP must reset to a lower level (though I don't know how much lower that will be than current levels) because previous spending levels were supported by an unsustainable growth in aggregate debt that is in the process of reversing. The total US private debt-to-GDP ratio has barely fallen, if at all (see the recent US debt-to-GDP chart from Steve Keen above, still at 350% or $50 trillion). 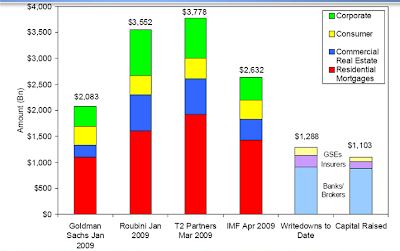 UPDATE (5/15/09): This can also be seen in the latest Fed Flow of Funds (Z1) data. As of the end of Q4 2008, household debt had shrunk only $70 billion from peak (i.e., a contraction of 0.1% of total debt outstanding), while both business and financial sector debt were still rising (though rising more slowly). 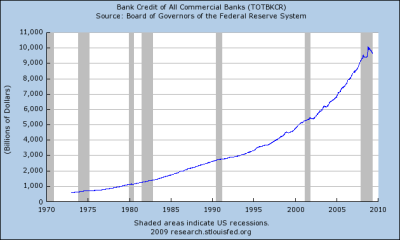 Also, US bank credit (this includes bank loans but not other kinds of debt such as bonds) has barely begun to contract, as shown in the Federal Reserve TOTBKCR data (see chart below). So it seems likely that the crisis so far has been primarily driven by credit crunch, loss in housing and stock wealth and income (e.g., disappearing mortgage equity withdrawal), financial sector losses, and slowing velocity of money — but that deleveraging via debt reduction is only just beginning and will likely run for years or possibly even decades, resulting in a continuous drag on GDP growth and a strong deflationary force that has likely not come anywhere close to its peak impact yet. One of the goals of policy makers will likely be to slow down deleveraging as much as possible, but Steve Keen (who predicted this crisis in detail and whose judgement I trust) thinks there is no chance of them stopping it. This makes sense given how large the loss of wealth so far has been and the resulting need to repair balance sheets and increase savings to replace the previous strategy of "saving" by relying on expanding asset price bubbles (especially housing but many others also). What are your views on globalization, immigration, and automation? I think that would make consumer debt service much harder. I don't think I have any particular insight on them, but I would guess they'd contribute to making a sustained cost-push inflation more unlikely (even after a supply shock)... though some would argue globalization may reverse some due to the crisis. So yes, debt service is harder absent inflation. Of course all three dynamics have been around to varying degrees for centuries (at least), and automation is just one aspect of productivity improvement.